Doctor Strange, Master of the Mystic Arts (1979) | 'TAIN'T THE MEAT… IT'S THE HUMANITY! 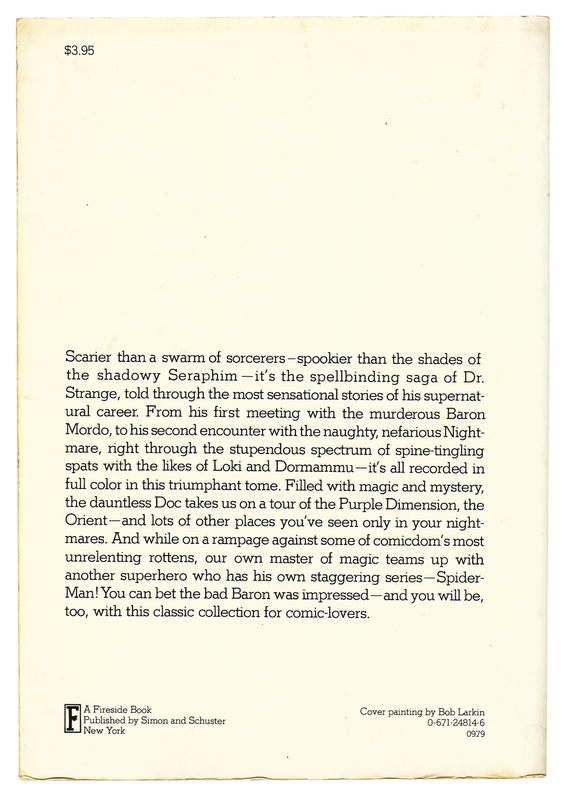 In the autumn of 1974 Fireside Books published a softcover collection of reprinted stories featuring characters from Marvel Comics’ popular back catalogue. Origins of Marvel Comics by Stan Lee is now widely considered to be the first trade paperback and was such a success that three more volumes followed between 1974 and 1977 – Son of Origins of Marvel Comics, Bring On The Bad Guys and The Superhero Women. With these four books began a fruitful collaboration between the two publishers that over the subsequent five years saw the release of a wide variety of titles including activity books, puzzle books, health and fitness books and even a cookbook. 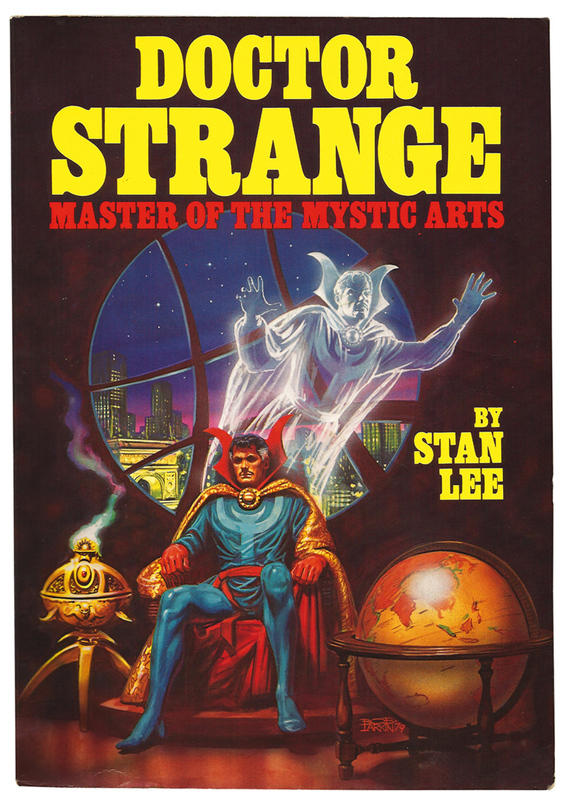 There was also a second set of reprint books that ran to seven volumes; Dr Strange, Master of the Mystic Arts by Stan Lee, published in 1979, is the sixth title of this second wave of titles. Clearly not wishing to fix what wasn’t broken, Dr Strange, Master of the Mystic Arts follows the same format established by the previous entries in the series but with one change: the page count dropped from 254 to 132 pages. Apart from that it’s business as usual and the book features reprints from ten classic Dr Strange stories alongside a preface, three chapter introductions and an epilogue by Stan Lee. Lee clearly has fond memories of the character and describes, amongst other things, the fun he had thinking up the character’s alliteration-heavy spells. He also attempts to analyse the appeal of the character while acknowledging the contributions of the two artists whose work features in the volume, Steve Ditko and Barry Smith. 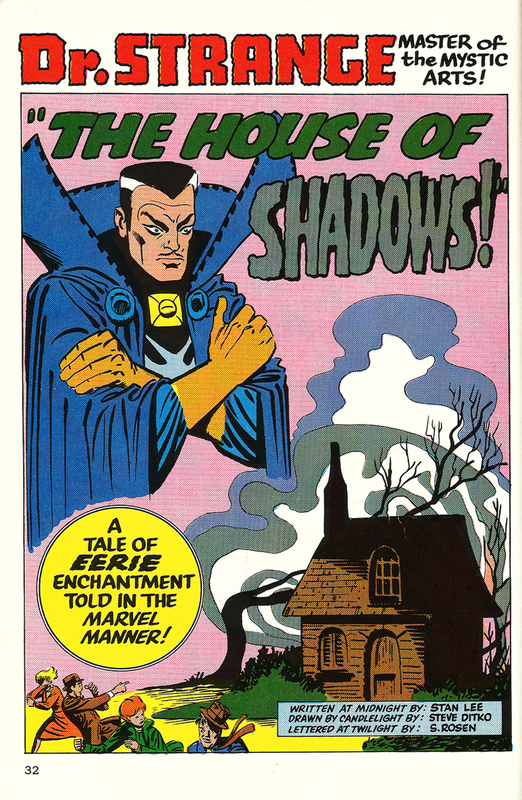 The stories reprinted in this volume are: “Face-to-face with the magic of Baron Mordo!” originally published in Strange Tales issue #111 (August 1963); “Return to the Nightmare World!”, Strange Tales #116 (January 1964); “Beyond the Purple Veil!”, Strange Tales #119 (April 1964); “The House of Shadows!”, Strange Tales #120 (May 1964); “The Challenge of Loki!”, Strange Tales #123 (August 1964); “The Hunter and the Hunted!”, Strange Tales #131 (April 1965); “Face-to-face at last with Baron Mordo!”, Strange Tales #132 (May 1965); “A Nameless Land, a Timeless Time!”, Strange Tales #133 (June 1965); “The Wondrous World of Dr. Strange!”, The Amazing Spider-Man Annual #2 (January 1965) and “While the World Spins Mad!”, Marvel Premiere #3 (July 1972). The book is a decent and entertaining read with none of the stories having been duplicated from the previous Fireside/Marvel books. Steve Ditko’s stories form the bulk of the book, as well they should as his run on Strange Tales from the 1960’s is still considered by many to be the definitive interpretation of the character and Lee acknowledges Ditko’s contribution to both the art and plotting. The inclusion of the last tale, plotted and drawn by Barry Smith, is a nice touch as it was the very last Dr Strange story Lee wrote. Clearly included for sentimental reasons the story is also a good read, favouring suspense and leisurely-pacing over action. That’s not to say the nine Ditko tales are lightweight, far from it. Ditko’s surreal artwork is always a delight and I always find myself taking my time when reading his stories as I pour over all the small details in his artwork – no-one but Dikto can draw the kind of hallucinatory, mind-bending panoramas that feature so prominently in Dr Strange’s stories. Final word must go to acknowledging Bob Larkin‘s excellent, brooding cover. I’ve mentioned before that I’m a fan of painted Marvel artwork, especially from the ’70s when the style was still new and innovative. Larkin, who also painted covers to many of Marvel’s monthly magazines, does a great job depicting Strange in a contemplative and somber mood. Out of the seven new titles from Fireside Books Larkin painted the covers to four and this is one of my favourites. I also like the typography used on the cover; Fireside have eschewed the eye-popping style typical of comic book covers and have instead strived to give the book a more mainstream feel that would have been familiar to regular readers of paperback fiction. Next up is the fifth Fireside Books collection, The Fantastic Four by Stan Lee from 1979.